could study martial arts. As a result, he vowed not to let his father down and worked very hard at his training. 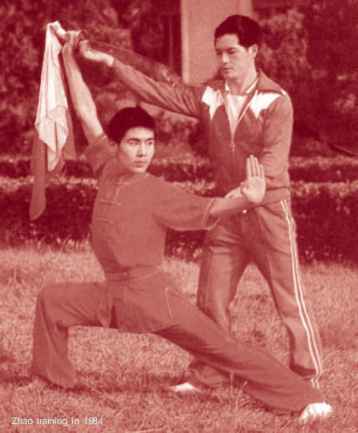 In 1 970, the Chinese government started to bring [jack some of the old skills and Wushu was one of them. Suddenly it becamea respected skiil. The Chinese government [began a searchfor talented young people to be representatives of the Wushu Athletic skill. This was also a time of [political change. China had finished their relationship with Russia and for the first time, was starting to have a relationship with America. Zhou En Lai started to promote Ping Pong as a way of increasing friendship with America. This what they called the small ball rotating the [big ball. A gentleman called Bai Man Xiang was chosen as the coach for Xian city He would be responsible for choosing and then training children to be a Wushu representatives for Ch ina. Out of the fou r h und red children from Xian alone that applied, only Zhao Chang Jun and a handful of others were chosen to study Wushu under Coach Bai. He was only ten at the time. Zhao realised then that there were so many talented people in his team. Even though he was only a boy, the government paid these children wages and gave them an education. Thechildren livedat the school where they trained. Everyday they had physical training, including jumping, handstands, hitting a dummy, position, footwork training, forms and all kinds of difficult training. They trained everyday seven days a week. 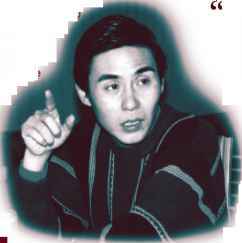 In 1972, when he was twelve yea rs old, Zhao Chang Jun went to the Ji Nan County competition. This was the first time that he met Beijing representative, Jet Li, who was two years his junior. They both did very well and won a prize. After this, people began to pay attention to the both of them. 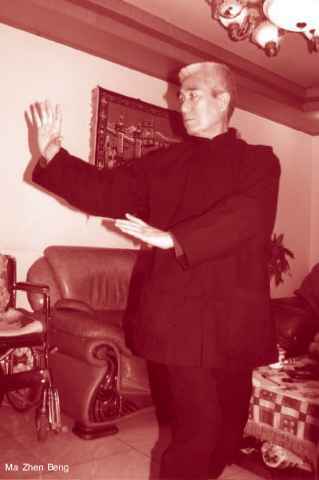 In 1973, the famous martial artist, Ma Zhen Beng, who was well known for his Xing Yi Quan, Bagua and Taijiquan, was invited to join the Xian Wushu team and train the students. Zhao was one of these students and was known to be the best out of all his team. Ma Zhen Beng was very strict. First he had everyone change their uniform to be a sleeveless t-shirt, no matter what the weather. He also made the students wear an iron band on each leg, weighing over 7lbs each, while doing training. In the beginning, everyone's legs were swollen and very painful, but everyone then knew, if you wanted to be good, you had to train hard. In the winter Xian can be very cold, even zero degree's Celsius. When it snows and with the wind, it is can be very cold, but stiil the students trained outside without any coats. The iron bands made their legs even colder and sometimes when the students would slap their hands on their arms and legs t o ma ke t hemselves warmer, the skin would crack and bleed. Nobody complained, they just carried on to train. At night, they could not remove their socks without soaking their feet in warm water first. This was be cause their socks had been stuck to the skin by dried blood. However, Zhao Chang Jun stiil carried on to train, though some others could not stand it and left. "At the age of fourteen, he fecarne a fittle Wushu Star demonstrations. Everywhere he went, the audience was full. At the age of fourteen, he became a liitle 'Wushu Star' in Ja pa n.
One of the Japanese government officials saw his demonstration and was impressed by his Di Tang Quan. Afterwards, he asked to meet Zhao Chan Jun and he said to him, "I am very impressed by your skiil and would like to give you a present. What would you like?" Xiao Peng, China's Premiere, said to him, "Well done Lite Diplomat!" This story was published in the Chinese newspapers and so his name became popular throughout China at the age of fourteen. Although Zhao took part in the competition next yearand competed against Jet Li, hestiil did notreceiveas high as a mark. It was not until 1980 that he won the championship and received a gold medal. This was the start of a very successful decade for Zhao Chao Jun. 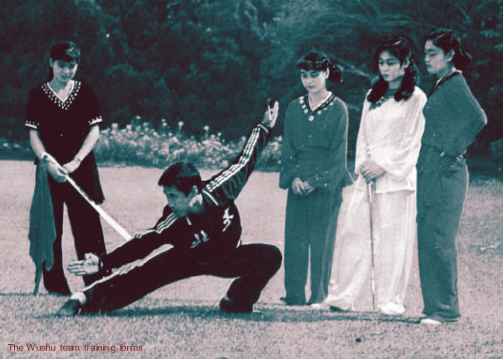 From 1980-1990, Zhao won the personal Best Wushu Performance Gold Medal each year. Everybody was impressed by his three major skiils:- Rolling-Ground Fist, Wnd Devil Staff and Tracing the Wind Broadsword. So high was his skiil, that itactually became the standard for measuring skiil in Wushu competitions. In 1982, he began to take part in some movies, including the movie, Fong Sai Yuk. 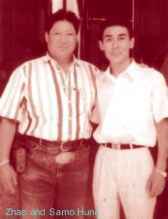 His training, competitions, movies and travelling kept him very busy and so in 1 987, at twenty-seven years old, he retired from Wushu competition and concentrated on movies and coaching. He really wanted to promote Chinese martial arts. 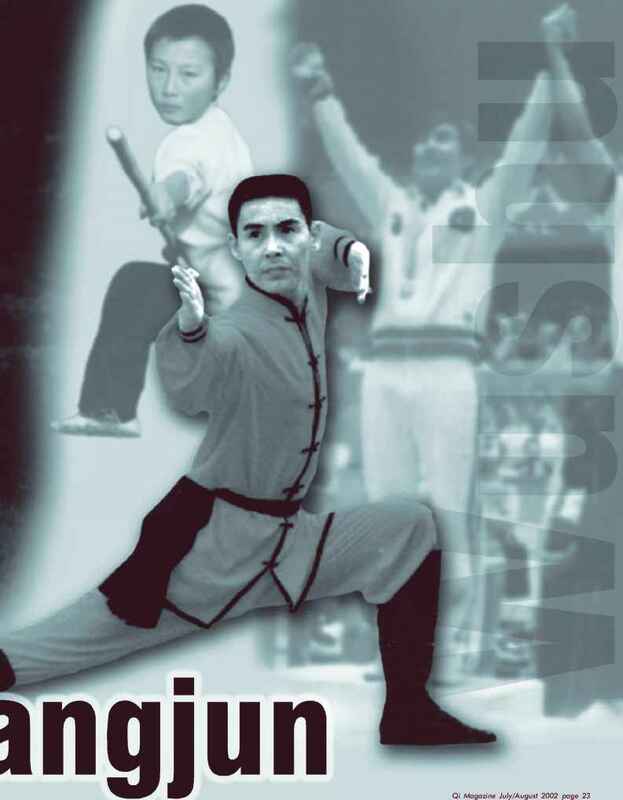 In 1991, he set up his own Wushu training school in Xian for training both children and adults, from China and abroad. 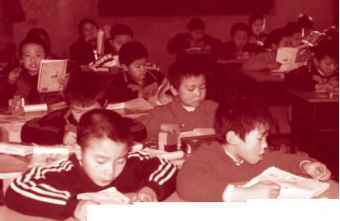 Children could live at the school and also study Wushu and also their normal classes. Over one thousand students can be trained at the school at one time. In looking back, Zhao Chan Jur^ found he got a lot of benefit from his Wushi studies and he started the school as he felt it was the time for him to give something back to the Chinese people. He knew he had the opportunity to go to the movies, like Jet Li, however, he preferred to educate the next generation and promote Wushu skiil. It should ae simpler in the beginning not only concentrating on the diificult movement photogenic in the movies. Samo Hung, Kung Fu brother of Jackie Chan, has visited Zhao's school many times. Donnie Yen, famous Iron Monkey movie star, has also trained with Zhao at his school. Deng Xiao Peng named Zhao to be a Wushu [Diplomat. He explains that there are two types of Wushu skiil. He says, "One type of Wushu is political Wushu and the other is traditional Wushu. 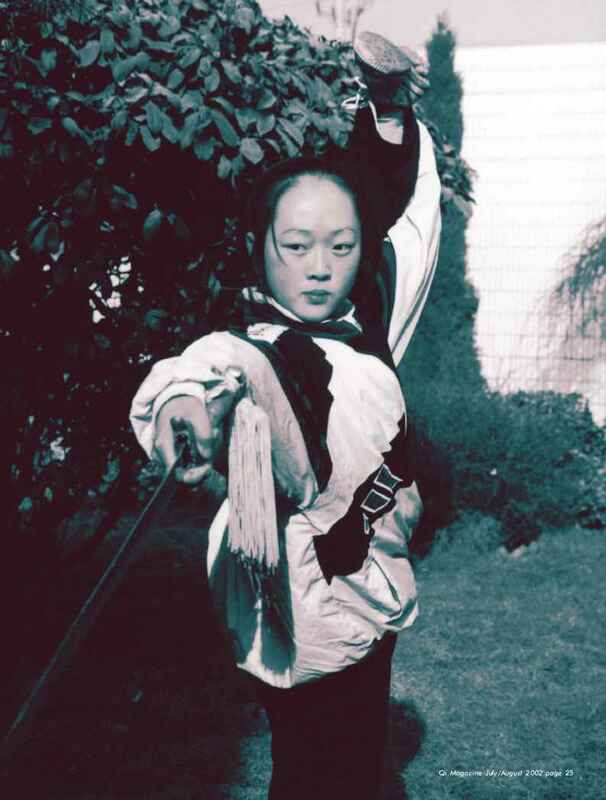 Traditional Wushu has history and its roots are based on fighting and health. It has philosophy and morality behind it. Peoplewho study traditional Wushu do so based on their own interest and you might not be famous. My two teachers, Ma and Bai, they love martial arts very much. If they miss practice fora day, theyfeel they are missing something. Just like me, if I do not read the newspaper for a day, I feel like I am missing something." "Today I am 42 and my teachers are over 70. They love Wushu as part of their life. I treat Wushu as a career. Political Wushu has a very short life. Many people study, but only a few are famous. That is like today, there are so many peoplewho are actors, but only a few are moviestars. These Wushu people start training by the time they are five and then retire by the time they are 30. They train movement six hours a day and many of them end up with a lot of injuries, li ke ballerinas or sports people." "I am the lucky one to have one success. Some of them, if they are smart enough, are already planning their next job before their Wushu retirement. But s ome of t hem do not think ahead and end up with a lot of injuries, wth no nameand then have to start their life again. People who study [political Wushu, most wii l co ncen t rate o n d iffi cul t movement. However, when they only concentrate on difficult movement, then it is no different from being a dancer or gymnastic performer. In performing Wushu, the most important is spirit and the internal energy. You should be able to clearly see the defence and attack in every single moveme nt." "Wushu performance is somehow like boxing. A boxer may be very good in the ring, but when they come down to street fighting, they might have problems. A good martial artist should be able to perform but also use the skill to defend themselves." "I think Wushu should be more simple in the beginning, not only concentrate on the difficult movement. Then more people can benefit from it. Then when they have more interest, they can go deeper. Many years ago, there was a foreigner who came to Chinato study Wushu. He loved towatchall the performances and he learned a couple of forms over the few months he was there. Then he returned back to America. After three years, he came back to China again. He thought his standard was quite good. Then, when he saw me performing, he said to me that he would never get that level. So he went back home and changed to study karate. This made me think that for Wushu to become popular, we have to make it more simple and shorter." School education is very impo-rtan-t at Zhao Chang Jin's institute learn and so more people can learn. Unlike some of the Wushu forms which are very long and strenuous." "Shaanxi Province has a famous martial art called, Ma Jia (Quan. It is very high level but not many people study So there are always two kind of people who study martial arts:-one just for enjoyment, one who wants to go deeper." Meeting famous Wushu Master, Zhao Chan Jun, was an honour. I first heard of him when I was in Hong Kong and just beginning my Wing Chun studies. Many people today want to study Wushu to became famous and make a lot of money However, promoting the spirit and the morality of Wushu is more important than promoting oneself. You can see that Master Zhao really puts his effort in it to promote Wushu to the world. Afterour interview, he said to me, "I want my students, after training Wushu, to become a good and decent people and to serve society." It is obvious that Master Zhao has a good heart. So many times I have heard people who want to study Wushu just so they can become a movie star. If you have good martial art skiil and star in a movie which just helps promote more violence in society, it wiil damage the new generation. You are helping to degradethe martial arts and bringing it a bad name. That wiil become your responsibility. This is a very strong exercise por pegine and pou shouldpollow step by step, prom easy to more dynamic. Do not use too much stength when pou do the exercises. phese movement are very good por streyhing the body and increasinggleXbiyty, even ipou are older. With everr exercise, pou should take it eass and then pou can pave good aealth and live longer. Sit on your bed with feet bare and legs straight in front of you on the bed. Stretch your arms forward and grasp your feet at the Yongquan point with your hands Meanwhile, breathe out through the nose. Repeat all the exercises 8 times and then rub your Yongquan points eight more times. a. Stand stil with arms loose. b. Swing the whole body to the left side, twisting your legs, ankles and knees. At the same time, let the left hand gently hit the back of the neck on the Dazhui point, right hand hiting the Mingmen point. 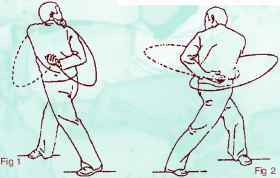 c. Repeat same movement on right side of the body, using the right hand to gently hit the Dazhui point, left hand hitng the Mingmen point. This movement is good Do the joits and waist. d. Bend and hold the knees with the palms in a squatting position. e. Rotate the knees 8 times clockwise and 8 times counter-clockwise. Breathe naturally. a. Bend and hold the knees with the palms in a squatting position. b. Push the knees open outwards and breathe in. c. Push the knees closed and breathe out. Do each open/ close movement 85 times. These movement are good for loosening the knee tenons and making the knees more supp le. a. Place right Laogong point on Dantian and left Laogong point on the Baihui [point on top of head. b. Rotate the hand on top of the (Baihui [point 55 times clockwise and then 55 times counter-clockwise. 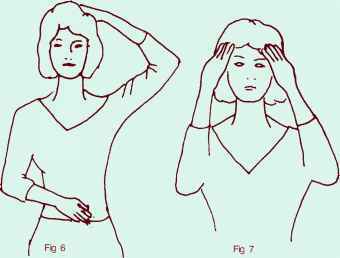 Both of the these movements are good for people who are losing hair and who have headaches. a. Hold onto the edge of table or counter with both body bent forward and legs straight, feet flat on the floor. Look downwards. b. Push the waist downwards so that thewhole body is straight. Look up. As you do the movement, breathe in. c. Stiil keeping the body straight, bend the elbows and let the body sink downwards, head facing forward. d. Go back to starting position and breathe out. Repeat each movement slowly and gently 8 times, keeping the concentration on the waist. After doing this movement, stand up and cross your arms and slap eachshoulder eight times. 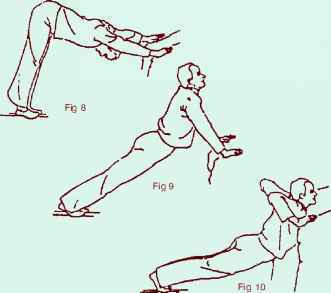 Thismovement is god/or stretching the back and strengthening the arms and waist. Hold onto a post with one hand and place the other hand behind your back and kick upwards towards the head vertically. Keep the standing leg straight as you kick. Do this 85 times. Change legs and repeat the exercise on the other leg. a. Stiil holding a post and placing opposite hand behind back, swing the leg from side to side 8 times. b. Repeat movement on other side. This movement is good for flexibility of the hips. Hello. My name is John Spinetto. 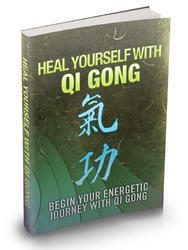 I currently have the honour and privilege of teaching for the Tse (Qigong Centre in Sheffield. I was born when I was veryyoung, but luckily my mother happened to be thereat the time. As a little being-sprout, I had no idea what I wanted to do when I grew up. There were the usual things; a nurse, a princess...then I realised I was a boy. At school I listened attentively as the teachers taught me all the things they said I would find handy later in life, such as where the Orinoco flows. One day, a fellow pupil observed me tapping out the rhythm of a popular children's T.V. show on the school desk, (Tom-Tom, anyone remember it)? I think it was during the (Geography lesson when we were being told where the Orinoco flows. He offered me the job of drummer in his band. The fact that I had never had a drum lesson in my life was a minor detail. Although stiil at school, we stared to get regular weekend work and offer started to come in. I was facing the first major crossroads of my short life; continue with the conventional academic path, or follow my passion for music. To quote Robert Frost, I chose the Road Less Travel led. Or, in the hip terminology of the time, I Turned On, Tuned In, [Dropped Out. I became swept up in the swinging sixties, and enrolled in the University of Burn-out. 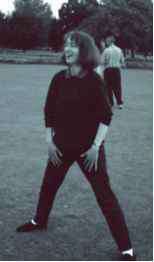 In 1996 I saw an advertisement for a new Qigong class starting in Birmingham, my hometown. I enrolled on the first night, and took my first steps on the path that has, in hindsight, beena turning point in my life. I give thanks for the great good fortune that brought me to study with Tse Sigong, Moy Sifu and all the other wonderful teachers and students of the Tse Qigong Centre family Heartfelt thanks to you all. And to my students too, sincere thanks for teaching meso much. Truly, the one who learns most in teaching is the teacher. May your Qigong studies lead you swiftly to the wide, open, sunlit plains of enlightenment. And no one has ever asked me where the Orinoco flows. John is qualified to teach the Wild Goose Qigong syllabus. He can be coniacigl rn 0114 263 0740. Kate is qualified to teach the Wild Goos Qigong syllabus. She can be corated on: 01926 451163. I well remember the day I walked into a local bookshop and happened upon Tse Sigong's book on Qigong. Lite did I know then, butthat small purchase was to radically change my life. Through my subsequent studies with the Tse Qigong Centre, I gradually came to realise how my high pressure job was beginning to affect my health. Daily Qigong practice began to clear my mind sufficiently to enable me to see the path I must take. Over a period of time I gradually eased myself outof office workand into self employment. 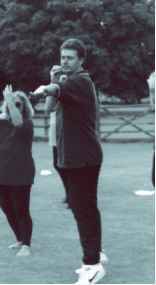 Thanks to the Qigong practice, as well as the career change, my health has improved beyond all recognition, and I am now stronger and fiter than I was twenty years ago. Everyday I think about this and marvel at it. It is like being a child let loose in a toyshop - I can't believe my luck. Being a student with the Centre has taught me so many things. It is not just about learning the ski11, although of course that is very imporant. Sigong has also given us a manual for living. Through my practice, and with the help of his wise words, I find I am more able to deal calmlyand philosophically with life's problems, and I no longer fretand worry so much about things that may never happen. How very forunate I am to have been born at a time when this precious skiil was being opened up to the public. It is both an honour and a huge responsibility to be asked to become an instructor. But if we can all play a par in training new generations of students, the skiil wiil be safe for the future. It has been a n exciting journey so fa r, a nd I look forward to the next stage wherever it may take me. Are 3 years enough to get good in wushu? How to do a wushu round kick? Do wing zhao and jet li know each other?